Today I am not sharing a recipe with you. 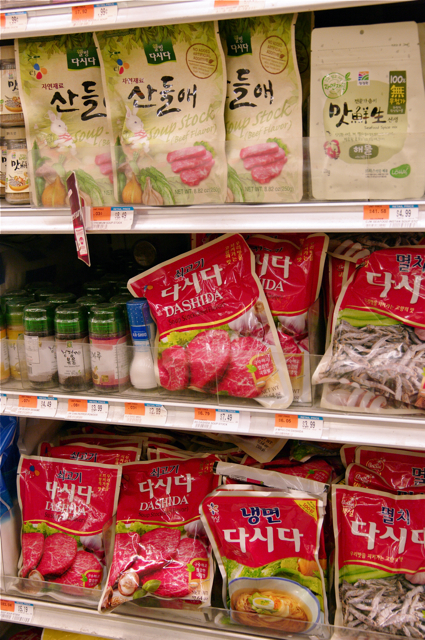 Again no recipe today, but I will guide you a grand tour to a Korean grocery store instead. Many people have asked me about Korean ingredients and how to use them. I realized that if you know the basic condiments and ingredients that are used in most Korean cooking, it will help you greatly understanding Korean cuisine. If you are the lucky one who can read Korean, life would be a lot easier to get the product you need. But not everyone is capable of that. So I will show you what to look for and how to use them. Keep in mind that there are hundreds of products in the store, and it is impossible for me to go through all the details, but the below items are the most common ingredients in Korea cooking. 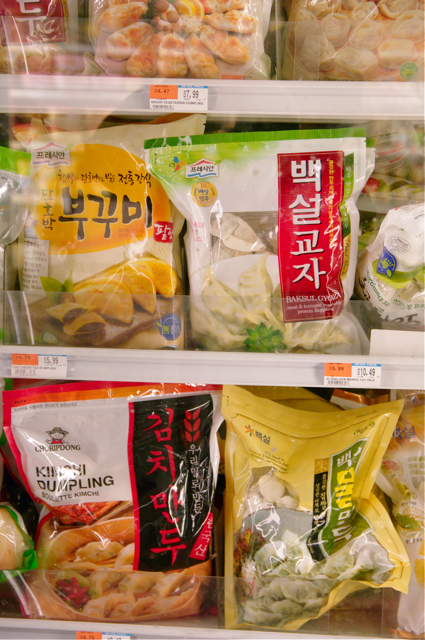 Thanks to the local H-mart who allowed me to take pictures of their products so I can post this article. Now take a deep breath, open your eyes wide, and watch your steps! Let’s go in. Go to the condiment isle. A little overwhelming to see so many product on the shelf. These are important bean pastes. Yes, very important! 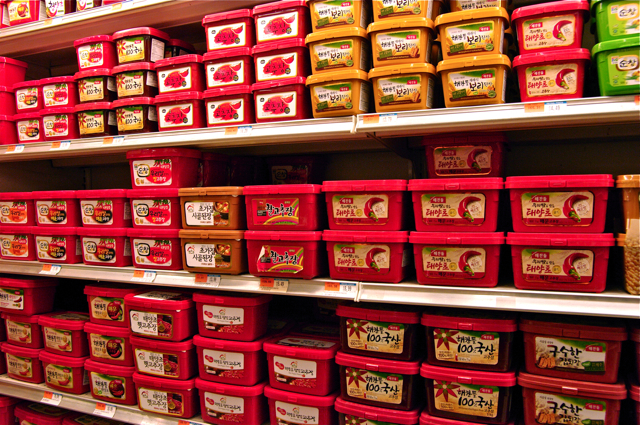 Red containers are for spicy red chili paste, 고추장(gochujang), for sauces and stews. 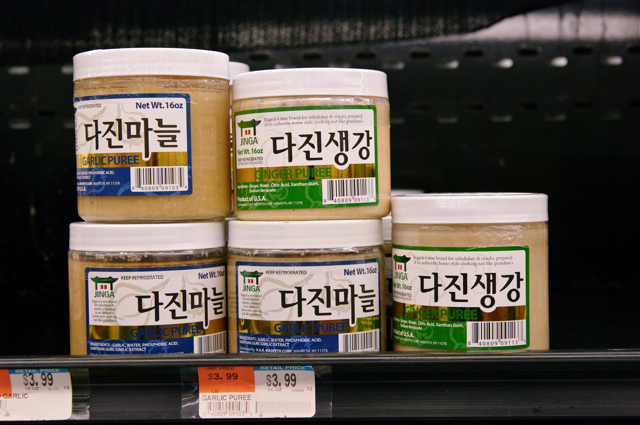 Beige/Brown containers are soy bean paste, 된장(duenjang), for soups and stews. It is very pungent and well known for its smell but Koreans can’t get enough. I use 순창(soonchang) or 해찬들(haechandle) brands but most of them are fine. 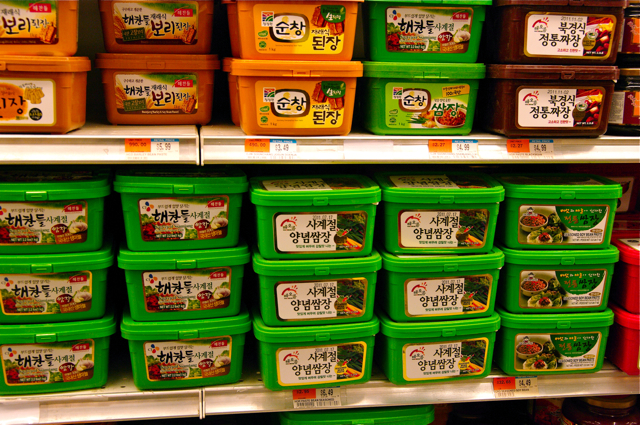 The green containers are 쌈장(Ssamjang) for topping sauce on the Korean BBQ, sauce for the lettuce wrap, dipping for vegetables, etc. They are basically mixture of gochujang and duenjang with some garlic and other seasonings. 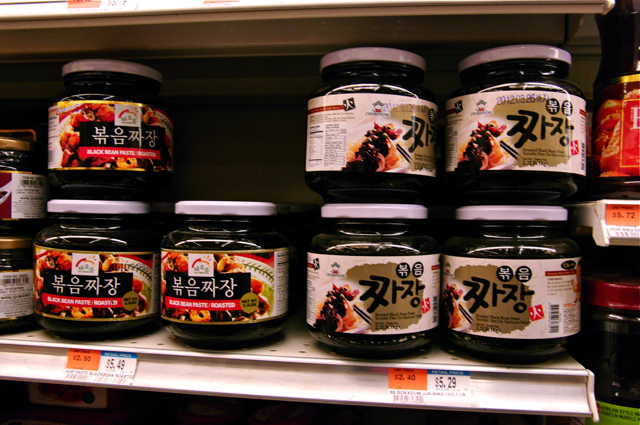 You will also find these black bean paste called 짜장(Jjajang). It is for the famous black spaghetti dish called Jjajang-meon in Korean-Chinese style restaurants. 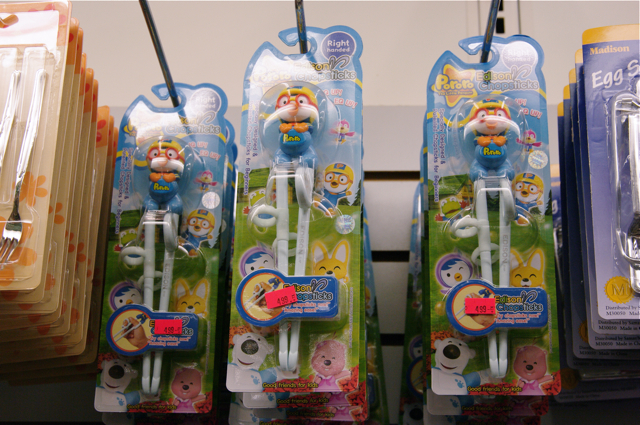 Originated from China but became more popular in Korea for some reason. My kids favorite dish to order. 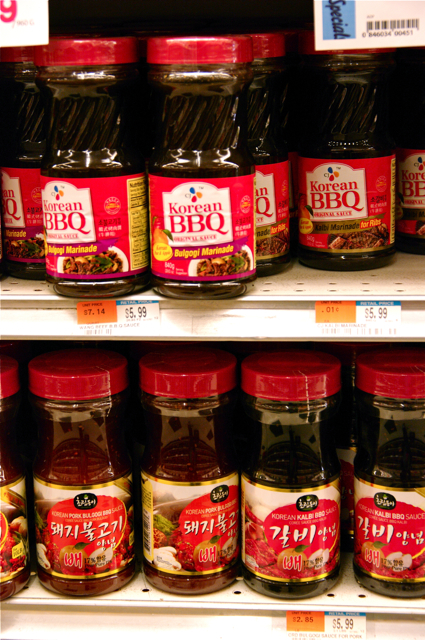 Korean BBQ sauce for beef and pork. 소(so) means cow, 돼지(dueji) means pig, 갈비(galbi) means ribs. 배(bae) means Korean pear. I’ve never bought any of them before so I can’t tell you how good they are, but it can be handy if you are in a hurry. 당면(Dangmeon), the famous japchae noodles. It is made with sweet potato starch. There are many kinds but look for pre-cut or individually wrapped ones unless you are intend to use the entire package at once for a big crowd. Glorious fish sauces. 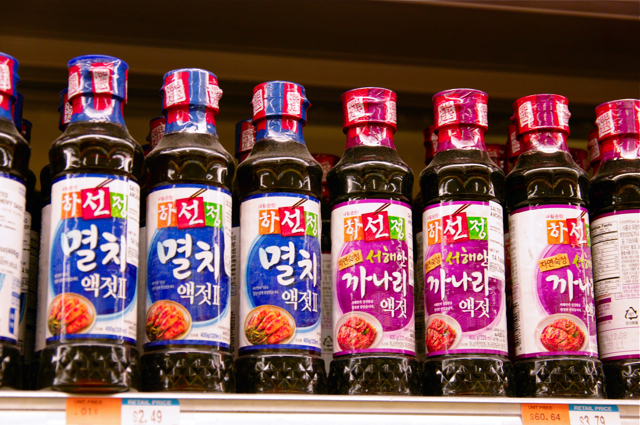 The ones in blue label are anchovy sauce(멸치), and purple ones are the other type of fish sauce(까나리). They both are used in making Kimchee and other dishes but I buy anchovy sauce. 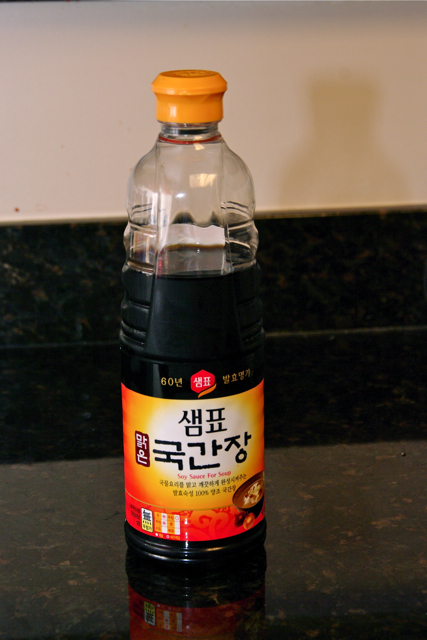 Korean corn syrup. These ones have fiber in them so they can be healthier option than regular corn syrup. Mirim. Similar to Mirin. sweet rice cooking wine (14% alcohol) for many uses. 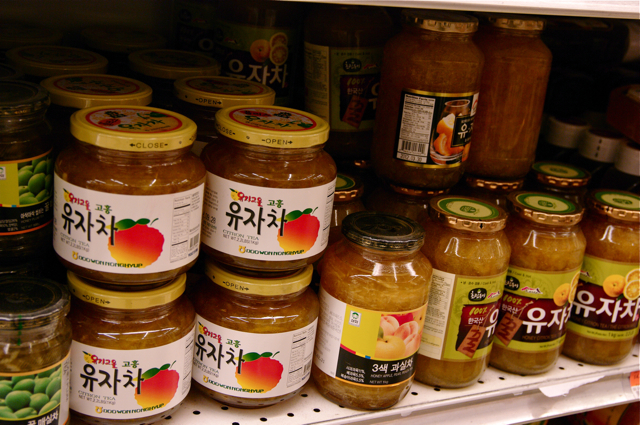 저염간장(jeoyum ganjang): low sodium. Healthier option to cut down the sodium. 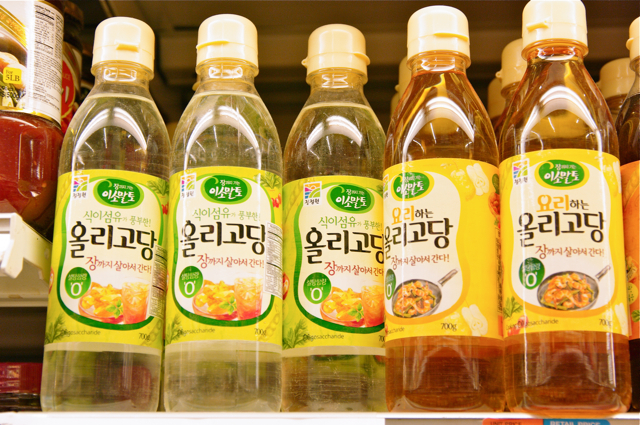 양조간장(yangjo ganjang): naturally brewed from soy, about 6 month of fermentation. good quality soy sauce. 진간장(jin ganjang): blended soy sauce, mixed with naturally brewed and chemically processed, short fermentation period of 3-7 days, darker and cloudier in color. 국간장(gook ganjang) or 조선간장(chosun ganjang). 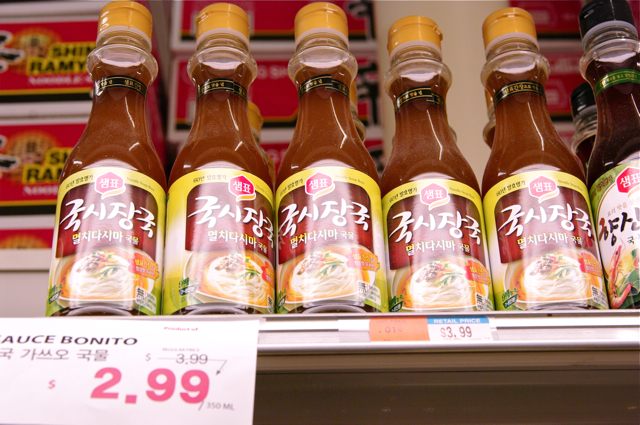 Korean style soy sauce, naturally brewed from soy for very long period of time. 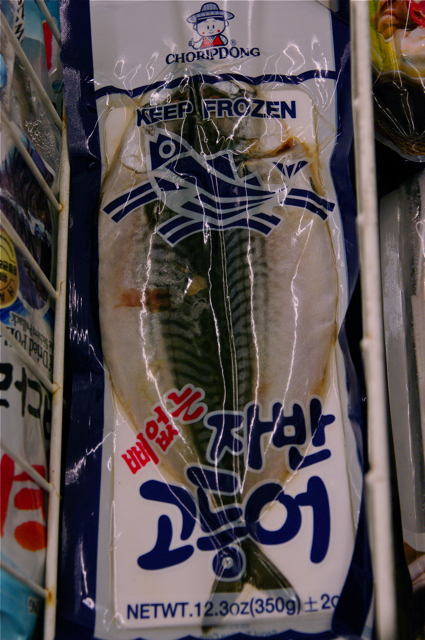 It has more translucent in color and saltier in taste. Good substitute for salt in soups and other vegetable side dishes where salt alone can not give the deep flavor. 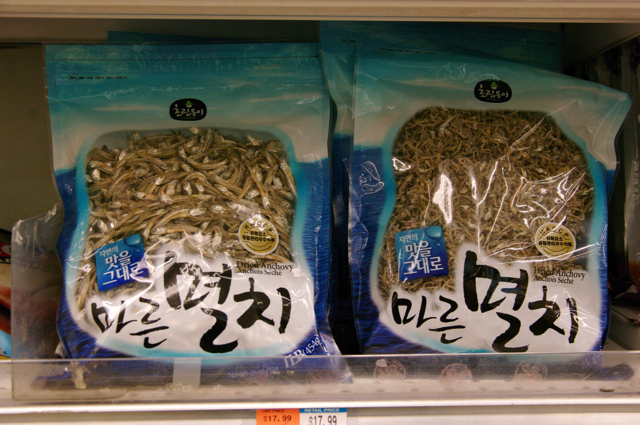 멸치(myulchi), Dried anchovies. Medium and small sizes for pan frying. 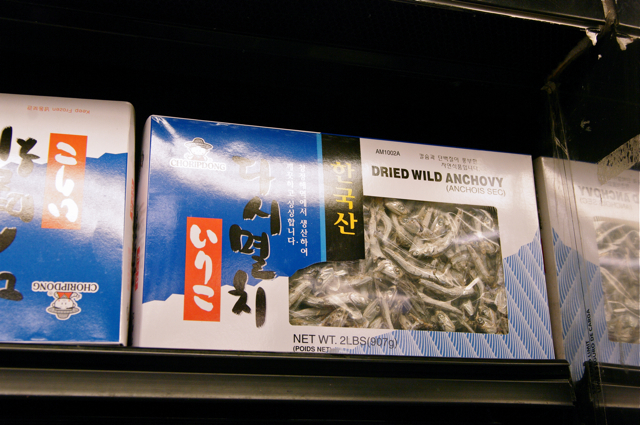 Large anchovies are for making stocks for soups and stews. 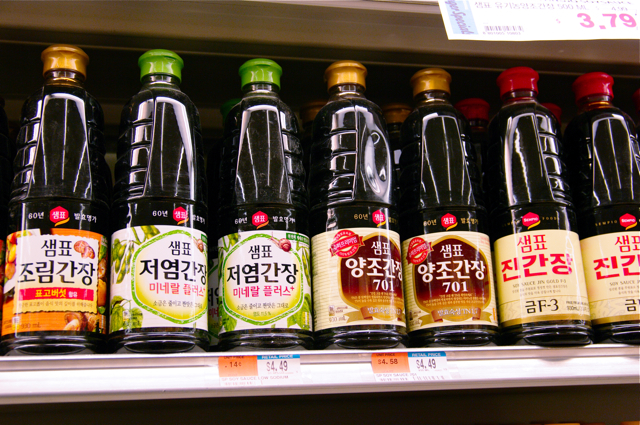 These are bottled concentrated anchovy-sea kelp stock. If you enjoy Korean soups and stews, anchovy stock is a must and these can be convenient when you don’t have time to make stocks. 다시다(dashid) Flavor enhancers. I hardly use them. If you need any of them to give extra touch on your food, look at the label and avoid the ones with MSG(monosodium glutamate). 고춧가루(gochugaru), Korean chili flakes or powder. Look for the coarse flakes for making most recipes. Fine powder is for making home-made chili paste. Look at the label and get Korean origin if possible. Chinese and Mexican origins are spicier. 소금(sogum), Korean sea salt. 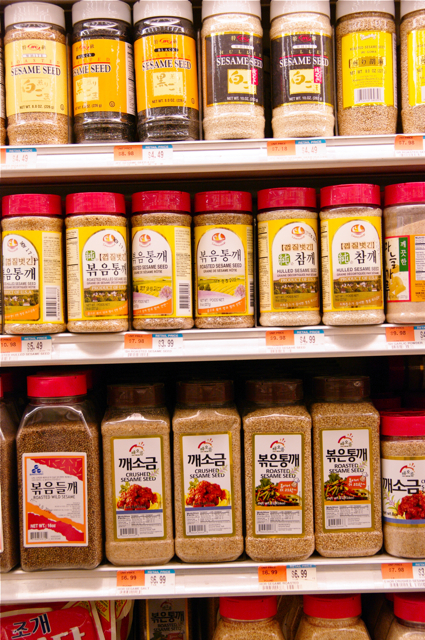 Coarse sea salt is for Kimchee, and fine salt is for general use. Korean origin is the best. 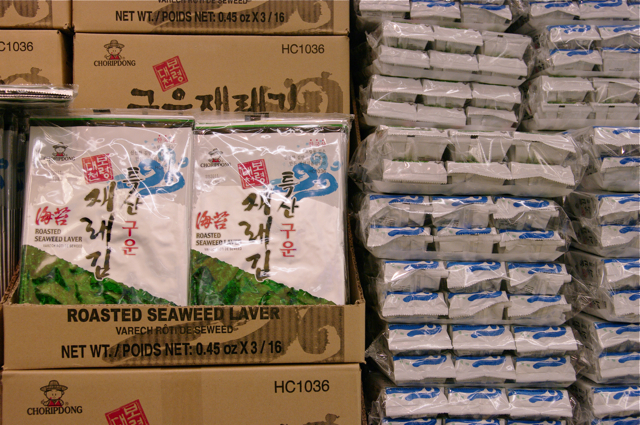 천일염(chenil-yum) is popular type of salt in Korea. Various sesame oil. 참기름(chamgirum) is regular sesame oil, 들기름(delgirum) is wild sesame oil which yield milder in fragrance. Roasted sesame seeds. Some in whole seeds or some crushed. I prefer the whole roasted seeds. 미역(miyuck), Dried seaweed. Good for soups and salads. They will triple in volume once soaked in water for 10 minutes. Most Korean mothers, who just gave birth, have to eat this seaweed soup for weeks-known for its nutrition of stimulating breast milk! That doesn’t mean non-breastfeeding people shouldn’t eat. I make seaweed soup very often and I am done with that stage. Thank Father above for that. 김(gim), Roasted seaweed in sesame oil or other types of oil. 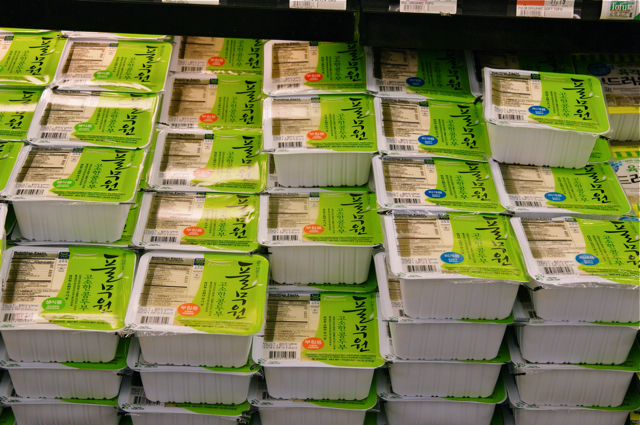 some in whole sheets or pre-cut individual serving packages. These are so good to wrap rice with. Once opened keep in the freezer. Addictive! 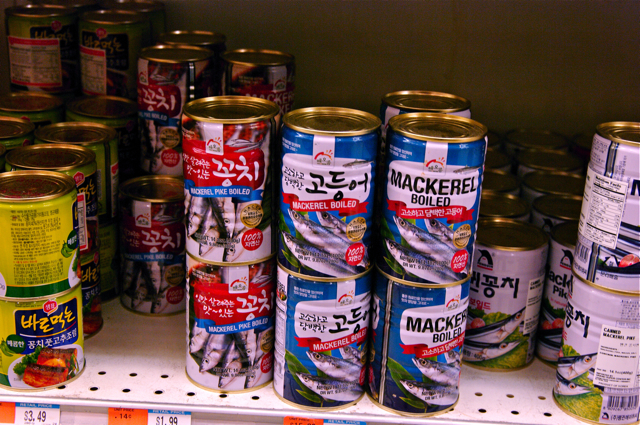 Canned mackerels(고등어) and pikes(꽁치). Pikes are slender fish than mackerels and their bones are finer but since they are canned their bones tend to melt away once cooked. They make wonderful stews with Kimchee or radish. 유자차(yujacha), citron tea. Wonderful remedy for cold symptom. Just add hot water. This isle is designated for full of various grains. I often mix white rice with brown rice, barley, wild rice, millet, etc. They need to be soaked overnight before cooking. Wonderful taste and so good for you. You can find mixed grains in a package as well. 튀김가루(tuigim garu), panko bread crumbs for deep frying. 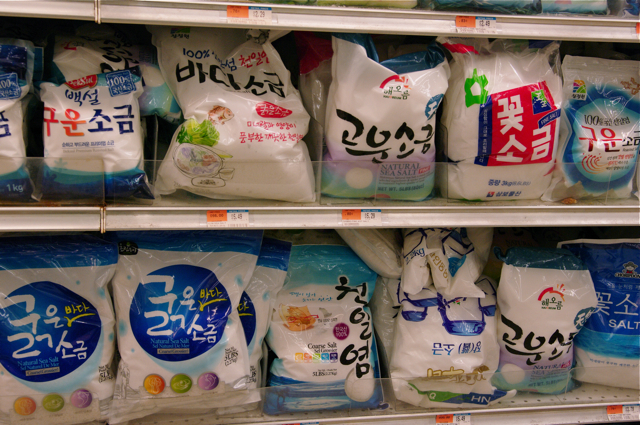 부침가루(buchim garu), Korean pancake batter mix for pan fried dishes. Most Korean restaurant used to serve roasted grain tea as drinking water to their customers. I am not sure why I don’t see them much any more. You just add these to boiling water let it simmer. Need to store the tea in the fridge and drink like water. 라면(ramen). 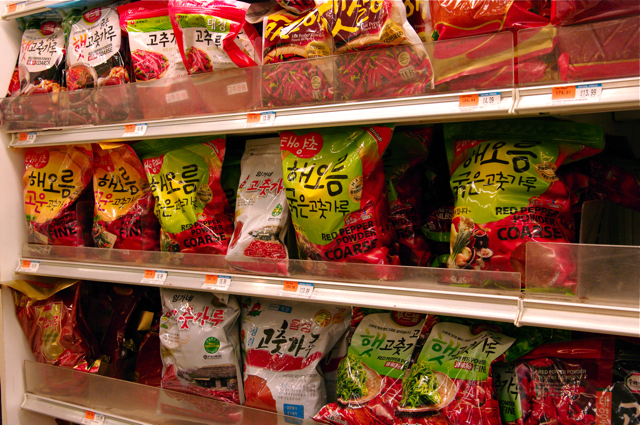 Usually red packaged ones are spicy and lighter color ones are mild. 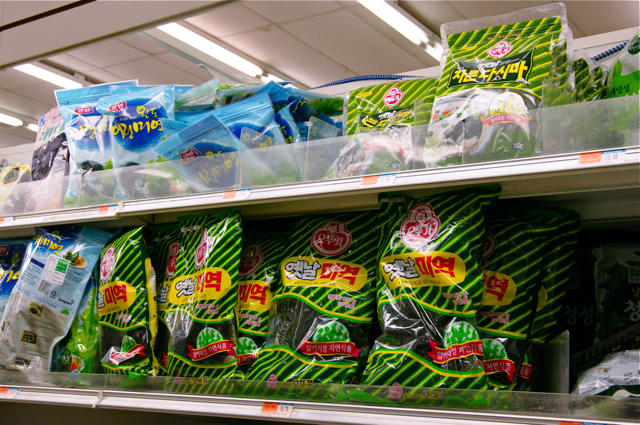 Black or dark brown packaged ones are black bean sauce noodles. My favorite tofu(두부) brand. 3 types. Green sticker: silken soft for raw eating. Some like to eat raw tofu for breakfast. I don’t. Orange sticker: firm tofu for pan fry dishes. Blue sticker: medium soft for soups and stews. There are also tofu in a tube called (soondubu) for spicy tofu stew. 2 types bean sprouts. Both are good for soups and salads. 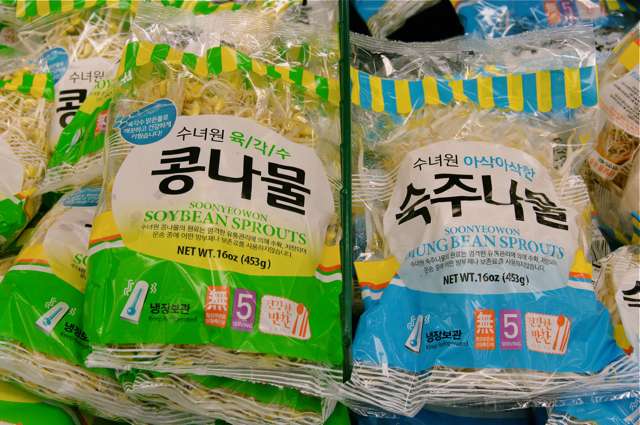 Soybean sprouts should be cooked but mung bean sprouts can be eaten raw. Some call it sesame leaves and others call it perilla leaves. Not sure which one is correct English name but its Korean name is 깻잎(kketnip). Very fragrant, wonderful to serve with BBQ, They Make Kimchee, or other side dishes as well. 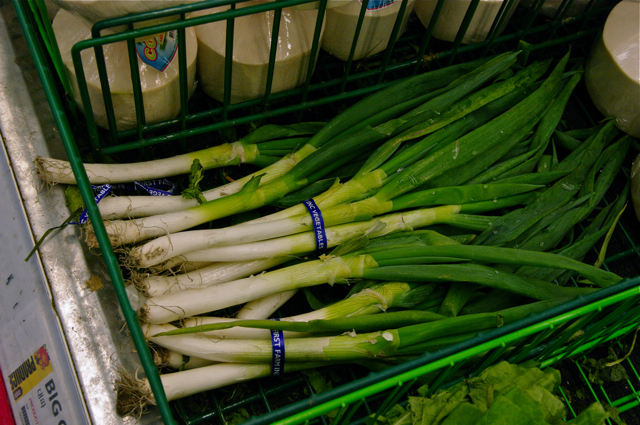 대파(daepa) Asian leek. Milder than green onion. Commonly used in Korean cooking. Pureed garlic and ginger for convenience. 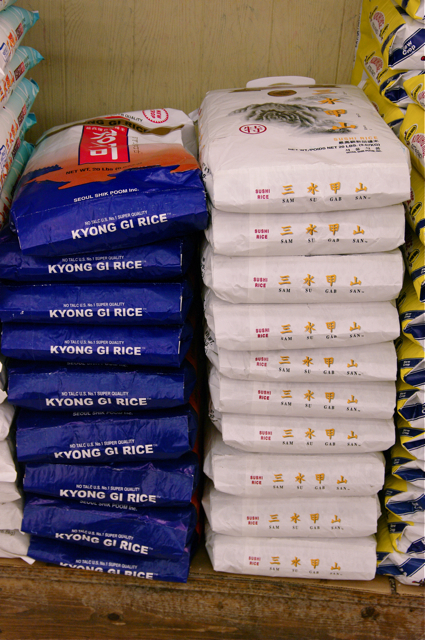 Korean rice but harvested in California. I use the one in white package called Sam Soo Gab San. Sliced rice cakes for soups. Kimchee! If I have to buy Kimchee I prefer the ones below. These are store made Kimchee and they tasted better than the ones in the jar to me. However, home-made Kimchee is the best. 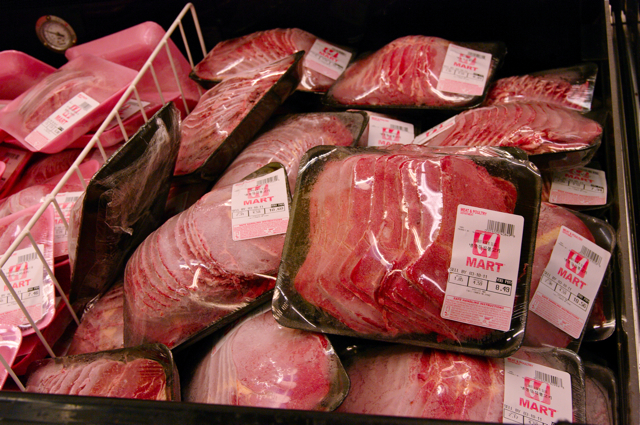 Frozen sliced beef for Korean beef. Usually beef rib eye or sirloin. I prefer thinner slices. 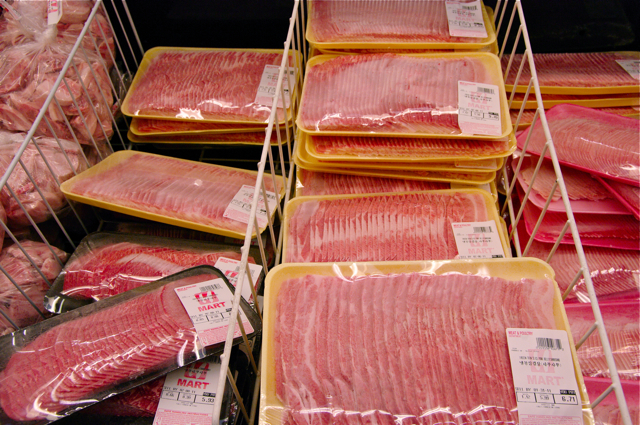 Pork belly slices for 삼겹살(Samgyupsal) dish. 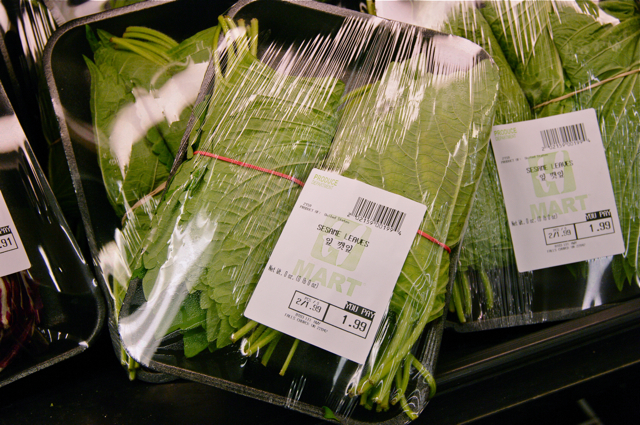 Perfect to pan fry, wrap with lettuce, and top with ssamjang. 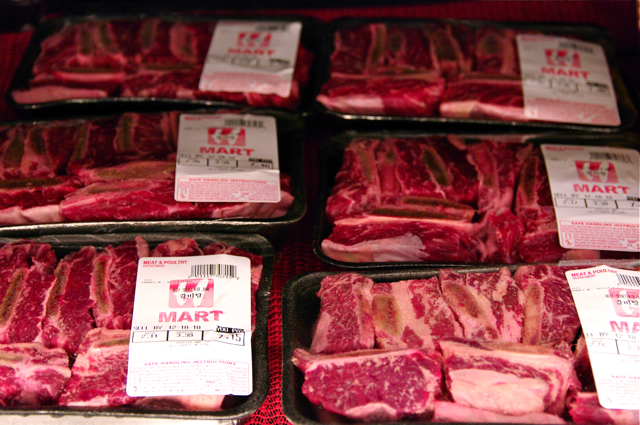 Beef ribs for stew and soups. 만두(mandoo), Korean dumplings. Various kinds with pumpkin, chives, pork, Kimchee filling. Pan fry, deep fry, steam, or boil. Quick and easy to enjoy. Serve with soy sauce/vinegar dipping sauce. 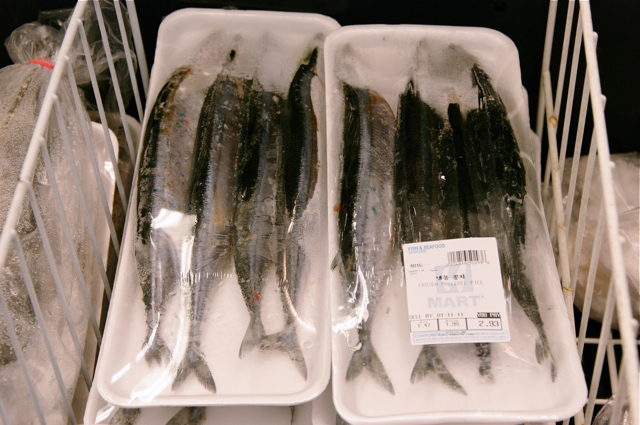 고등어(godenguh), salted boneless mackerel. Good for pan fry or broil. 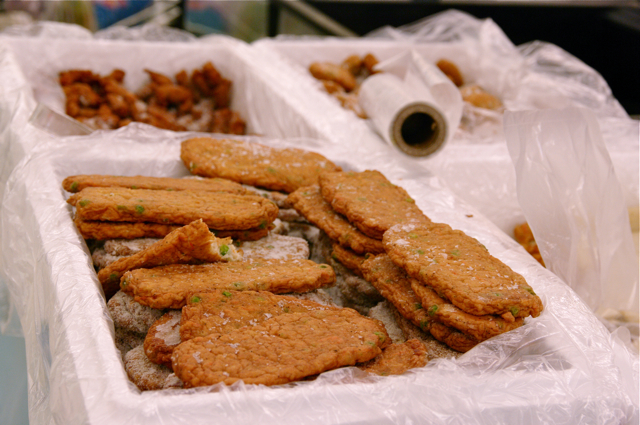 어묵(uhmook) fish cakes. These have some vegetables in them and taste better than prepacked ones. 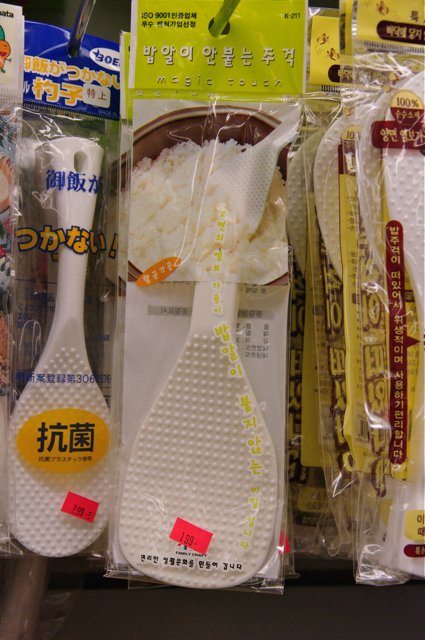 Rice scoop. These have spikes so the rice don’t stick on the surface. Chopsticks with finger holes for easy use. These are for training preschoolers but I have seen ones for adults. Do you need a pair? Well, the grand tour is over. 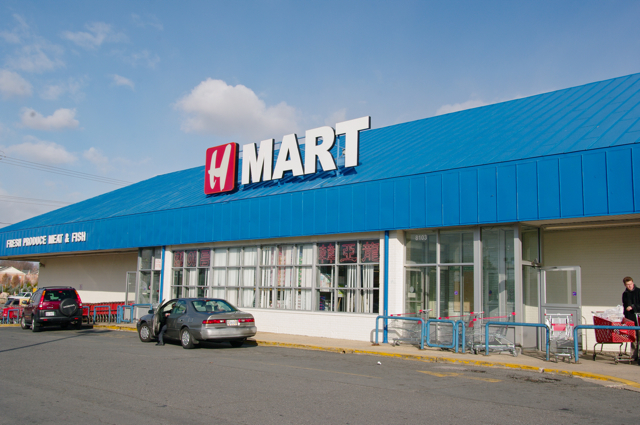 If you are looking for the H-mart near you, click here. If you live in the area where Korean food is unheard of, you should be thankful that you live on 21st century where everything is available via world wide web. For Hong Kongers, There are couple of stores in TST. The store below delivers items to your door if you buy certain amount of $. FYI, the shop next door sells various Kimchee and side dishes as well. If you know other locations in different countries, please, feel free to share on this post. Great post! I am a Korean-American and found your tips very helpful, especially the brand recommendations. Thanks for the tip on storing the gim packages in the freezer. Happy new year! Oh, thank you very much, I am excited to find some of these new things. I appreciate the photos, too! Great post! Now I know what's in all those little plastic tubs! 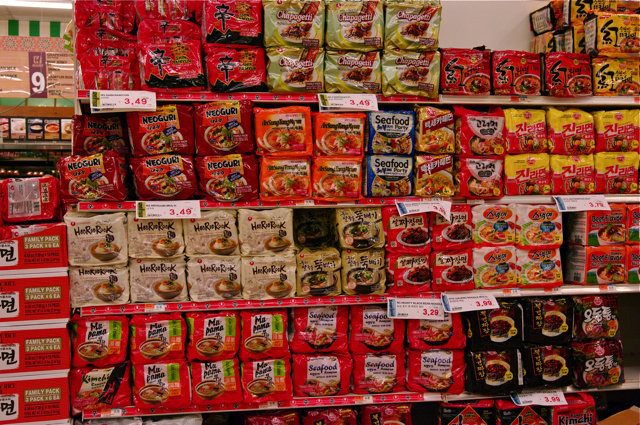 BTW, we have a new H-Mart in Houston, TX now. Wonderful store. Thanks so much for sharing your wisdom and your recipes, I love your blog! There's a great Korean market in Pittsburgh on Forward Avenue called Young's. They have all of the items you feature (though their meat is frozen). 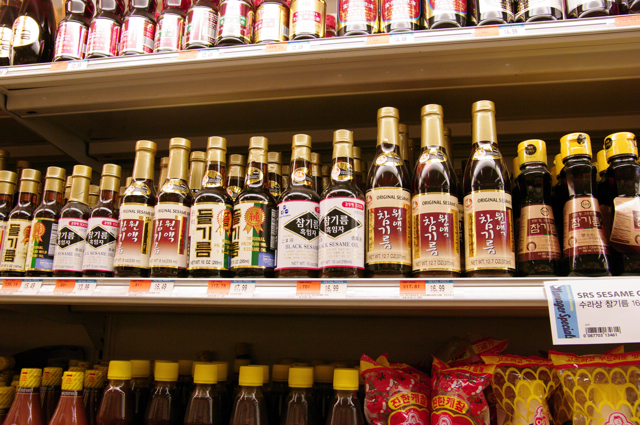 I am glad to hear that there is a good Korean groceries in Pittsburgh. Thanks. Hi Holly, I enjoyed your post! 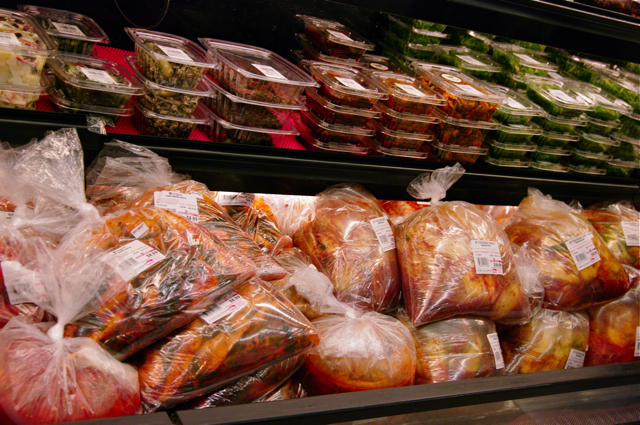 I don't go to H Mart in my city much(Vancouver, BC) because it tends to be more expensive and there are soooooo many family owned Korean grocery that are extremely well stocked and cheaper. I just love popping by once in a while just to browse. There's one just simly called Kim's mart. I also love Korean bakery. One thing, I'm pretty sure deul-gireum, is made from perilla plant, known as deul-ggae to koreans even though they are not botanically related at all. I guess they are culinurily related. And the leaves are again perilla leaves. Thanks Freddie for clarification. You are right. Deul-gireum is from the seeds of perilla plant. They are less fragrant that sesame oil. Most Koreans use the toasted and grounded seeds of perilla plant to make many vegetable side dishes or add to the soup. Adds very nice nutty flavor than the oil. 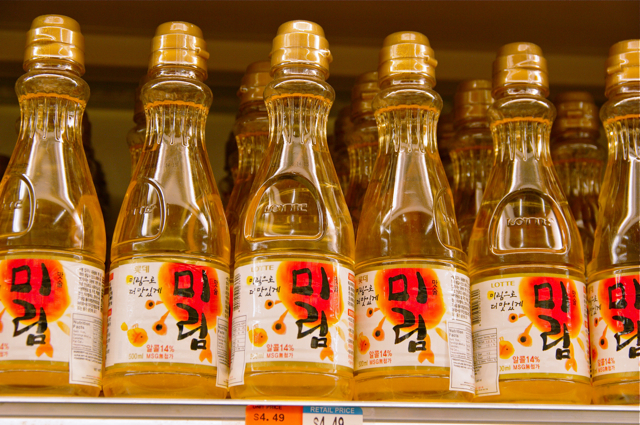 The oil goes rancid faster than the sesame oil, so buy the small bottle and keep in the fridge. I used to shop at the Assi Plaza supermarkets in Duluth and Suwanee, Ga., before moving to Alabama (where I make do with a Chinese supermarket for Korean ingredients or reasonable approximations) - I looked them up and apparently there are several in other states too - http://www.lotteplaza.com/branch/branch.php?Id=62&lan=ENG - so those may be an option for other readers as well. Hi! I was wondering if I only have small anchovies can I use them to make stock? 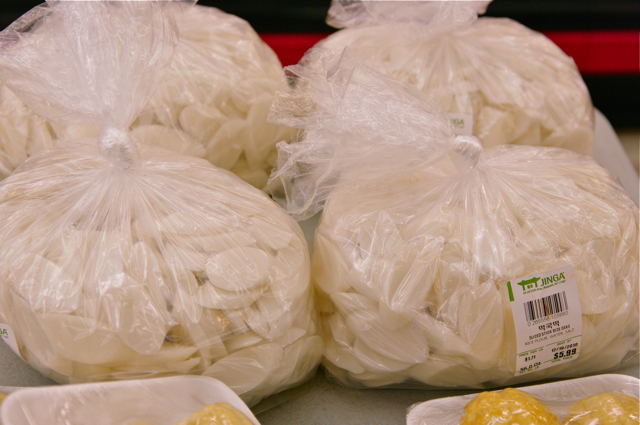 Also what brand of the larger rice cakes, the ones you used in your street food recipe, do you use? Thanks! I love your site! Hi Kathryn Yes, you can use small anchovies to make stock. You will need more since they are smaller. For the brand of rice cakes, I don't particurailly remember the brand name I used. 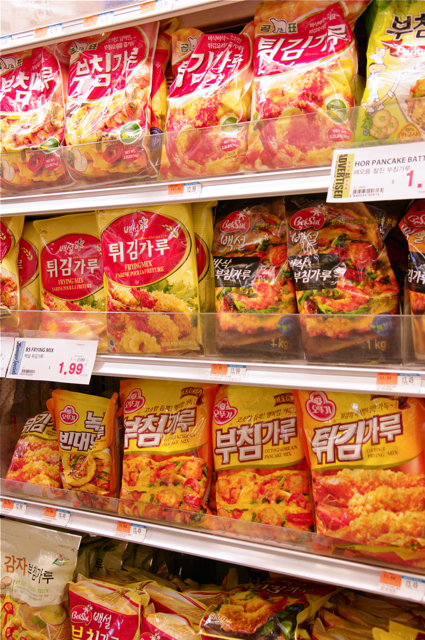 If you are making tteokbokki, the spicy rice cake, any rice cake sticks they sell in Korean stores will work. Thanks. I have just returned from a week in Seoul, inspired & determined to recreate some of the wonderful food I loved so much out there. Your blog is amazing and this post in particular SO helpful, explaining th staples of Korean cooking. Thanks so much! Hi Micol I am glad that this post is helpful to you. Hope you get to cook delicious Korean food soon. Thanks a million for this Holly! Very helpful to a non-Korean who loves eating and cooking Korean dishes! 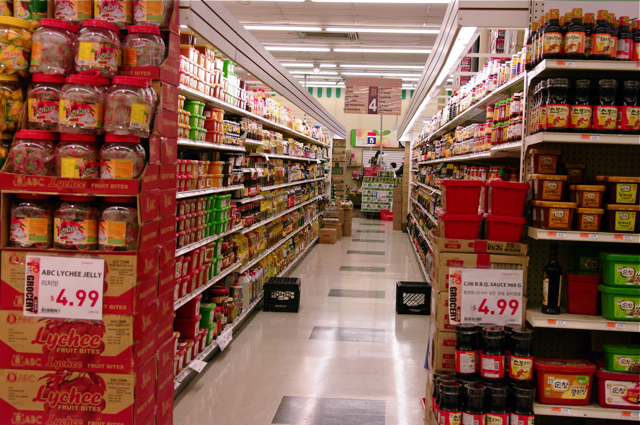 I've been Korean my whole life and yet still try to navigate these aisles. Thank you for arming me to cook more Korean! I did a google search for a Dak-galbi recipe and found your blog and all it's treasures! 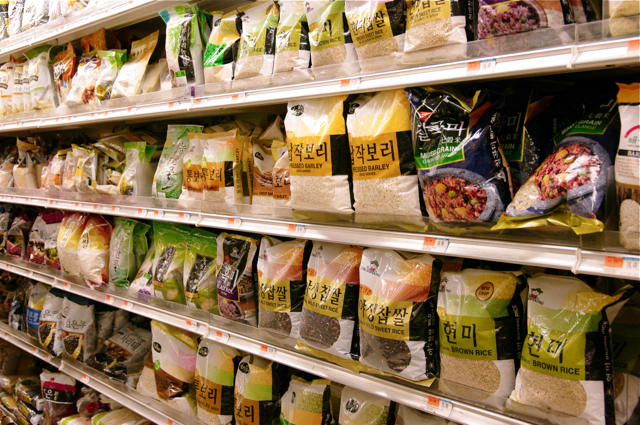 We are an American family stationed in Korea and I love Korean food and culture but have been a little afraid to venture into the local grocery stores for fear that I won't know how to find what I'm looking for. You have laid to rest all my fears! I cannot wait to get out to the local stores and start shopping! Thank you! Thank you very much for this wonderful post! I am an American completely in LOVE with Korean food. I have started to cook some of the recipes at home and need as much help as possible. I shop at our local international store and see all of these items....THANK GOODNESS. I have had questions about many of these ingredients and this has covered all of them. Now I finally know what is in the green container for example :). Thanks again! Lakewood, Washington (near Joint Base Lewis McCord) has an entire Korean commercial section with an H Mart (new), a Bo Han grocery store and a large Shin Shin store. I have yet to explore the other Korean-based stores. As a non-Korean, I've shopped there and come home with items I only had a vague idea how to use. This was very helpful. I now know the difference in my miso-pastes. Great post! I love Korean foods and am forever searching for new recipes and ingredients. My husband on the other hand is blasé about it. 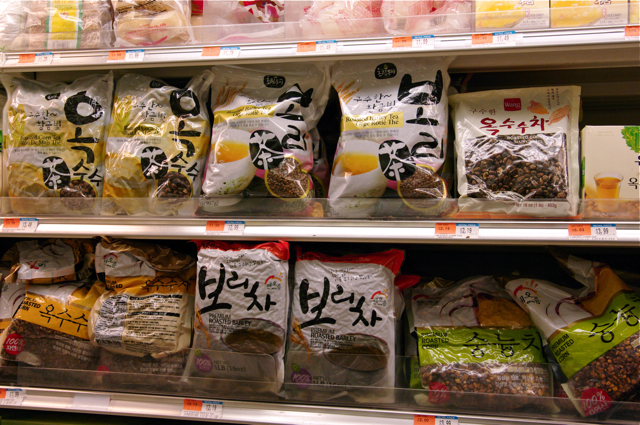 Hi Holly: I am Canadian and have found Korean foods in Canada in a grocery chain called T&T Supermarkets. They are located in major cities west of Quebec or online.. thanks...enjoy your posts very much. Thanks for the information, Karen! Hi there. I found this via a Google search and love the suggestions! 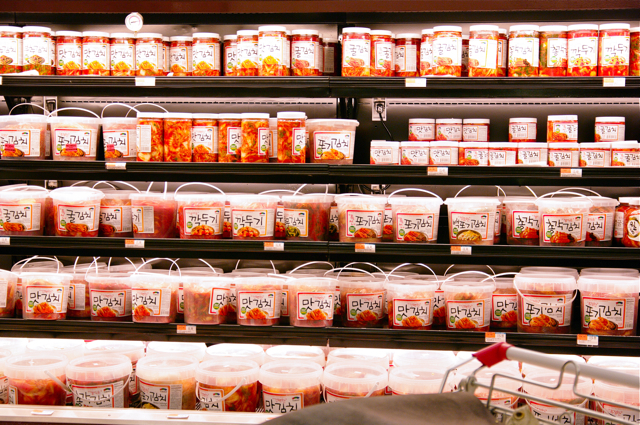 I've been shopping at Hmart for a few years and this explained questions I still had about some of the products!! I'll always remember the first time I made soondubu and didn't use Korean red pepper flakes, but used the ones I would get at the local store.... Let's just say a taste test sample was way too spicy! Thanks again for your suggestions.